The Holland America Line voyage on the MS Volendam with Captain Peter Bos at the helm would take us—my adult daughter and me, to the other side of the world, land of Maori culture and legend, from rugged sea coast where toned bodies surfed the huge waves in the western part of the Bay of Plenty, to lush vineyards that stretched against a backdrop landscape of eye-blindingly blue sea and, most importantly, to friendly locals. At the end of it all we would see the famed Sydney Opera House in Sydney, Australia, voted the world’s best city to live in for the second year in a row. Cherie and I would fly Qantas Airline from Los Angeles to Auckland, New Zealand, to join the ship in harbour. The Volendam would circumnavigate the North and South Islands of New Zealand to ports of call with exciting names such as Tauranga, Napier, Christchurch and Dunedin. We would cruise Fiordland National Park—part of the Te Wahipounamu (native Maori name)World Heritage Area— to see immense valleys sculpted by glaciers during multiple ice ages, to get close to waterfalls, and to cruise into one of the park’s longest fjords, Milford Sound, visiting also visit Dusky Sound. Two days at sea and we’d reach Tasmania, a southeastern state of Australia. But first we would cross Bass Strait overnight to reach in the wee hours of the morning Australia, the world’s smallest continent in the Indian and Pacific Oceans. First stop would be Melbourne. The next day we’d sail to Sydney before flying home. On the Qantas flight to Auckland, we settled in for the fourteen hours’ flight with complementary wine from some of Australia’s best known vineyards: Yering Station, Adelaide Hills and St. Hallett. If it hadn’t been for the fine wines, top flight service and excellent dinner served by Qantas, the long flight would have been an ordeal. Cherie chose Moroccan-styled roast chicken and I chose seared tuna with lime and pepper sauce. While Cherie slept I watched half of the epic film “Australia” starring Nicole Kidman and Hugh Jackman, both actors Australian born. I had never seen the film and found the Qantas screen too small to capture the full scope of the film. I hoped the Volendam would show Australia in its Wajang Theatre so I could really appreciate the film on the wide screen. I wasn’t disappointed and watched it twice, once with my daughter. We arrived to Auckland around 6 a.m. After we passed through Auckland airport customs we took a bus to port where the ship was in harbour. Once through port customs we went aboard. Champagne greeted us in our cabin. A large picture window covered the room in natural light. It was fun to watch the action on the pier as people began to arrive to the ship. But this wasn’t the time to take in the true beauty of our home for the next two weeks. The Renaissance-era themed ship with fountains imported from Italy, valuable works of marine art by Captain Stephen J. Card, and elaborate fresh floral arrangements throughout the spacious common rooms would have to wait. The Volendam wouldn’t leave Auckland with her 1,351 guests until midnight. We made our way to the very top deck and enjoyed lunch in the Lido restaurant with views overlooking the city of Auckland and the harbour. Once off the ship we took the harbour seabus (five minutes by ferry) to Devonport—a small town with heritage charm with signs of Maori settlement that date to the mid 1300s. We found a naval base there. Massive trees along the seaside with thick roots spreading out from the base in search of deeper soil line many Devonport streets as the Pohutukawa tree is the national tree of New Zealand. We poked our heads into cafes, book stores, restaurants and gift shops. After we took pictures of clusters of sailboats with colourful sails we headed back to the ferry for the mainland. We enjoyed dinner most evenings in the elegant Rotterdam dining room, taking Chef Rudi Sodamin’s recommendations. Does sashimi of salmon with wasabi mayonnaise as an appetizer sound good? A Merlot, Veramonte Reserve wine from Chile was served. The Rotterdam faced the ocean and offered a sweeping staircase leading from the upper floor dining level to the main floor. We enjoyed Trinity Hill Sauvignon Blanc from the famous Hawke’s Bay area of New Zealand the first evening. Some evenings we dined in the intimate setting of the Pinnacle Grill where fine wines from around the world were served. Pinot Gris from the Whitehaven vineyards in the Marlborough area was a feast in itself. Seafood and fine cuts of beef are a speciality. The exquisite cuts of meat are displayed on a silver trolley as sample that a waiter brings to your attention before you select your meal. The wine list was superb as was the dining. Porthole magazine’s Editor-in-Chief, Bill Panoff, says the Pinnacle Grill offers an unmatched anywhere on the seven seas sophisticated dining experience. We would be at sea for the next two days. We’d eventually circle White Island, the site of an active marine volcano. Spencer Brown, Travel Guide, offered expert commentary over the outdoor loudspeaker as the ship silently turned this way and then that way for an up close and personal vantage point of the spewing volcano. The ship is truly an engineering wonder. When in open sea, the top cruising speed is 18 knots. Environmental Officer Dolf Kramer, born and raised in the Netherlands, answered questions about how the ship preserves the environment. Long gone are the days when anything went overboard. Hotel Manager at sea, Robert Versteeg from Bithoven, Holland, and Cruise Director Rebecca, are just two of the “go-to” people on the Volendam if anything isn’t to your liking. Over the course of our cruise, Cherie and I could be found just about anywhere on the ship involved in any number of exciting activities: the state-of-the-art Culinary Arts Center, sanctioned by Food & Wine magazine, where we learned the fine elements of creating an exotic martini, the history of coffee, or how to make Pannatone Tiramisu—a holiday tradition desert in Italy. There’s even a kid’s cookery program. 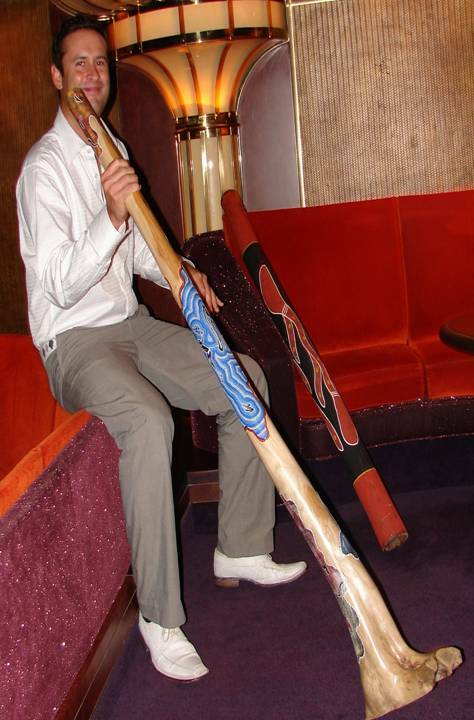 We took part in many daily programs (Travel Guide Spencer Brown gave a talk on the First Peoples of New Zealand followed by a live didgeridoo performance). We caught nightly live Broadway-style shows in the two-story Frans Hals Lounge. The gym and spa offered ocean views. One of the cruise highlights was the Indonesian Afternoon Tea ceremony with organic teas and coffees from the world’s finest plantations and Indonesian sweets. Keeping in touch with the world and friends was a snap in the Explorations Internet Café. Our first port of call was Tauranga, New Zealand, a land settled and still revered by the Maori native people. The area is known for kiwi farms. We took a shuttle bus into town. The weather was unbelievably enjoyable, bright and sunny without a beating-down-on-your-head sort of feel. We bought cotton shirts and ate local oysters at a fresh seafood shack by the water where a seafood festival is held in November. We wanted to taste kiwi wine but couldn’t find it. The oysters were big and plump and tasted of sweet milk. I’ve never tasted anything like it. We hiked the rest of the afternoon, unexpectedly finding ourselves at the ocean amongst surfers. I found myself suddenly kicking up my heels at the edge of the surf while my daughter snapped photo after photo. Still cruising the South and North Islands of New Zealand, we stopped at the port of Napier, a community founded in 1856 by Sir Charles Napier, a British official in India. 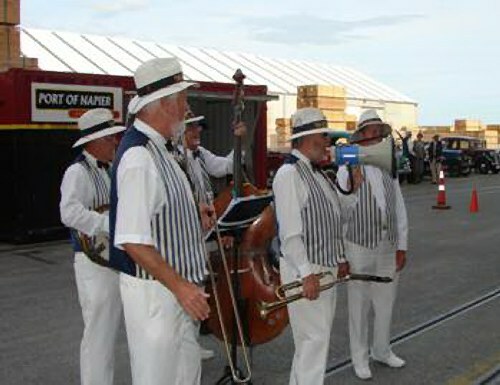 A lively musical band and antique automobiles greeted us at port. Cherie took a stroll along a black sand beach in the morning while I myself toured some of the top vineyards of Hawke’s Bay. The vineyards are so lovely an entire week in the area wouldn’t be too much. At Church Road Winery, founded in 1897, I ventured deep inside the original concrete wine vats that now offer an intriguing wine museum. Mission Estate Winery, founded in 1851, is a vast estate ideal for weddings, fine dining and wine tastings. Mission hosts an annual concert. February 13, 2010, celebrates The Legends of Motown with The Four Tops, The Temptations, Mary Wilson of the Supremes, Martha & The Vandellas and many top names from Australia. The city of Wellington with its pretty harbour and picturesque architecture saw Cherie and me on the Kelburn Cable Car in the centre of the city and up a steep hill to the Botanic Garden with Carter Observatory. Get your cameras at the ready for the view is wonderful as are the formal gardens. The Lady Norwood Rose Garden was spectacular. There are countless shore excursions from which to choose, including where the film “Lord of the Rings” was filmed. In Picton, originally called Waitohia, at the head of Queen Charlotte Sound, we were presented with a tiny nosegay of fragrant Old-fashioned roses when we got off the ship. The still floating hull of what is believed to be the ninth oldest ship in the world is that of the East Indian Edwin Fox. See it near the museum and the ferry wharf. We enjoyed a private lunch of locally caught river salmon at Barewood Garden after touring Yealands Estate winery. Peter Yealands is a local fellow who looks very much like a charming character straight out of a period swashbuckling Hollywood film, gray beard and hair in somewhat need of a trim; but highly knowledgeable when it comes to wine and the environment. In Christchurch Cherie and I visited ChristChurch Cathedral in Cathedral Square where the annual Festival of Flowers (19 Feb. – 14 March 2010) decorates part of the church. We ate sushi in Cathedral Square, drank McDonald’s coffee, strolled along the Avon River but couldn’t rent an antique punt because we only had credit cards, and walked to the must-see nearby botanic gardens on Rolleston Avenue. Just minutes from Cathedral Square you can swim at the Centennial Leisure Centre. We watched the open tram rattle by and wished we’d first taken this for a firsthand view of the city. Nonetheless, Christchurch is ideal for walking as major cultural attractions are within one square kilometre of the city centre. 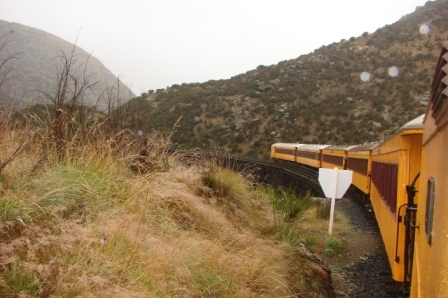 In Dunedin we took the heart-stopping Taieri Gorge Railway over the southern hemisphere’s largest wrought iron structure to travel through tunnels and high up into the alpine hills. At one of the train stops I bought Strathdale organic clover honey and New Zealand Paua Shell jewellery used traditionally by the Maori and wished now that I’d bought more of both. New Zealand’s daylight is of an extraordinary and luminous quality which made the cruise into Fiordland National Park all the more spectacular. The park is New Zealand’s largest national park at 3,000,000 acres with immense valleys sculpted by glaciers during multiple ice ages. Novelist Rudyard Kipling considered the Fiords the Eighth Wonder of the World. In Tasmania, the 26th largest island in the world with a population of 500,000 mostly around Hobart and more than a third of the state World Heritage national park and forest reserve, we along with other Volendam passengers met Mayor Alvwyn Boyd and his wife Gwenda at Burnie pier. Lovely pewter “Burnie” pins were handed out. We took the free shuttle bus into town and walked along the short beach front before searching out a health food store to buy tee tree oil at The Soapbox on Mount Street. We learned that the highly praised local Angus beef is exported to a Japanese market. We returned to the ship for a light lunch and then our shore excursion took us by bus to Gunns Plains Cave, about an hour’s drive from Burnie in Leven Canyon. We drove past lush vegetation where huge ferns seemed out of a prehistoric era gone berserk. Named after famed botanist and Tasmanian explorer Ronald Campbell Gunn, the Cave opened in 1909. The air is fresh even though the walkways are a touch damp. The limestone cave opening leads to a steep flight of 54 cement steps. The largest “ribbon” stalactite in the world is found here as well as stalagmites and flowstone suspended from the vaulted ceiling. When the lights were turned out momentarily, glow worms dotted the black space far above our heads like so many stars in the night sky. The Volendam’s Greenhouse Spa and Salon continued to beckon with ocean views, terrace, steam rooms, hot tub, exercise facility and best of all heated ceramic lounge beds. The cruise ship has two pools on the Lido deck—one salt water and open to the elements, and one beneath a covered dome revealing natural light. One day while my daughter enjoyed a spa treatment I stretched out like a lazy cat over the smooth wood trim surrounding the outside pool. Blue skies above, warm breezes and, best of all, the gentle rocking of the ship lulled me to near sleep. Other times from various decks that were almost vacant of passengers I watched the Shy Albatross in flight with a wingspan of over two metres gliding above the southern oceans following the Volendam. Melbourne is the second largest city in Australia with a population around 3.5 million and the capital of Victoria. About 150 languages are spoken. Lively shops and restaurants line the harbour where the Volendam docked. We took a morning shore excursion into the country to see wildlife—Kangaroos, Koalas and the protected Black-tailed Wallaby. In the afternoon on our way back from a tour of the city by foot and historic rattling trolley ($3.70 each for 2-hours) we sat on a bench in the harbour and simply gazed out to sea and understood perfectly the many accounts of how friendly the people of New Zealand and Australia are. We’d heard about the Sydney Harbour Bridge Climb—one of the world’s preeminent engineering marvels—over 1500 metres of steel; but didn’t have the four hours’ needed to complete the climb. You can do this climb by day or by night. We can only imagine what the sensation would feel like to be atop Sydney Harbour Bridge: the Blue Mountains in the distance, the city at our feet. The Sydney Opera House was all and more that photographs suggested. Sydney’s 4.2 million population is said to be the most densely populated in the world, but it’s hard to believe. The city appeared spacious and languid. There are chic terrace restaurants at the Opera House. We had signed up for a bus tour of the city and now found ourselves looking at the Opera House from a multitude of vantage points. Soon we were at the crest of a hill that overlooked Sydney. This was just a taste of a beautiful city, of a memorable cruise but a taste that tantalized.